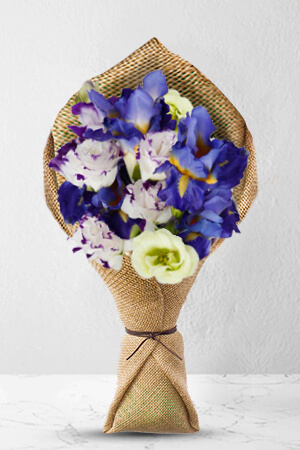 Jayda is a rich mix of carefully selected Eustoma and blue Iris, which will delight men and women alike. It offers value will packing an impressive punch in terms of its delicate beauty that is sure to please.Our bouquets do not include a vase. However, for a bigger impression we recommend a Standard vase, which is an ideal selection for this gift. Liked the reminded you sent plus flowers are all ways lovely. As always. The flowers look lovely and the delivery was prompt. Very easy to preorder and the flowers were delivered on time. I'm assured by my friend in Adelaide that the flowers were absolutely beautiful. was easy to use and the items were all very nice making it hard to chose just one. the person who received the flowers said they were lovely and just what we had ordered. It was easy to view,select and order the flowers.